SM Mall of Asia Arena on Facebook advised that tickets for the 27th FIBA Asia Semi-final games today, August 10, 2013 (Saturday- Evening games) are already sold-out. Meanwhile, those who want to see the live actions at the MOA Arena, FIBA Asia 2013 official venue may still buy STANDING (SRO) tickets. It will be available at the MOA Arena Marina Way (Green) ticket booth starting 5pm. Lined-up tonight are match between Chinese Taipei vs. Iran and and Philippines vs. So. Korea. Note that for SRO, 1 ticket person will be given per person and will go straight inside the venue after purchase. Customer will no longer be allowed to leave the line after purchase. Special lane will be provided for the standing (SRO) ticket selling. SM Mall of Arena has a seating capacity of 16,000 for sporting events and full house capacity of 20,000. 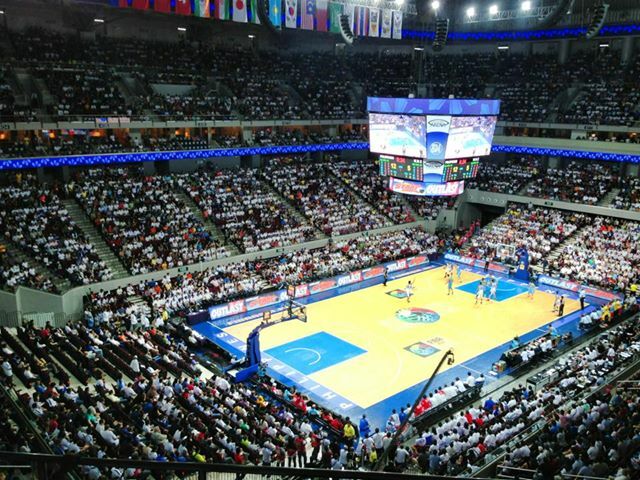 In the FIBA Asia 2013 quarter-final game between Gilas Pilipinas vs. Kazakhstan last night, the official attendance according to MOA Arena (via Facebook) is 17,273. Follow Us on Twitter or Like Us on Facebook to receive updates related to Smart Gilas Pilipinas on FIBA Asia 2013 tournament and the road to FIBA World Cup 2014.